If you choose to burn bought-in wood chips, care must be taken to select a supplier who can give you an assurance of quality, as required by the joint HETAS and Woodsure assurance scheme. A good starting point is to view the Biomass Suppliers' List (BSL). Their interactive map enables you to search for suppliers in your area by postcode, zoom in and locate suppliers in your area and filter by both fuel type and assurance. We like it so much we included it on our fuel page. It is also important to visually inspect any delivery of wood chips. As part of the delivery paperwork, the moisture content of each load should be stated on your receipt. Details on biomass boilers that can burn this type of fuel can be found on our wood chip boiler page, you can also find out about our entire range by going to our biomass boiler page. If you have your own supply of wood fuel, the largest cost savings of up to 80% versus fossil fuels can be made. 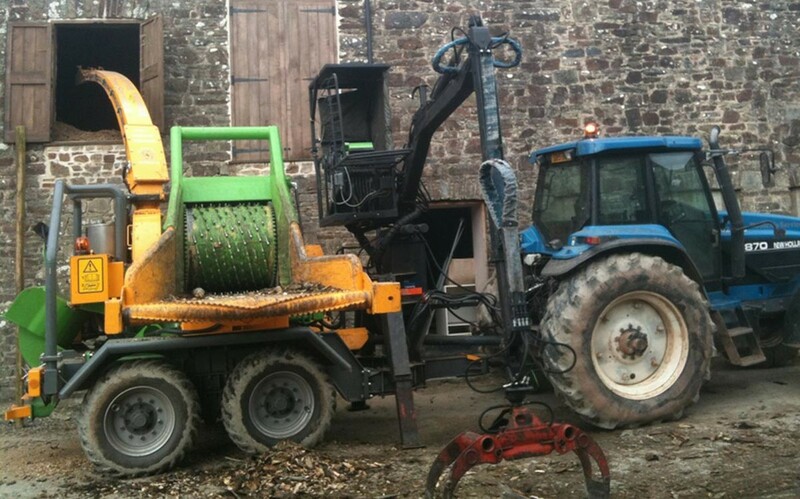 Contract chipper hire varies in price, depending upon size. As an alternative, woodland owners can sell back their own wood to fuel suppliers in return for discounted fuel. There are a range of considerations relating to producing wood fuel of the required quality. Firstly, the wood must be fully seasoned to a maximum moisture content of 30% prior to chipping. To season, logs are usually stored on raised bearers with the ends facing the prevailing wind and left uncovered to air dry. Wood has a tendency not to re-absorb water once seasoning starts, so leaving it uncovered improves the process. A fuel grade chipper with set screens should be used to produce chips of the right specification from the seasoned wood. General agricultural chippers are actually shredders, reducing the volume of material produced from arboricultural work, and don't give the same control over chip size. They tend to produce long shards of wood, which can wrap round and block the boiler auger feed, so make sure the contract chipper you plan to use is fuel grade and can chip to P16A or G30 with an average chip size of 3mm. Fuel stores should be covered and enclosed and we recommend building a store as large as you can, in order to minimise fills. The store should have an access and inspection hatch and the floor should be level with the agitator sweep arms. The stores should be cleaned out annually, during Summer when the boiler may not need to be operational. For woodland owners, there are a range of grants available from the Forestry Commission to support the development and management of woodland. The table below gives an overview of the relative densities per cubic metre, the CO² emitted per kWh of heat generated and how many units of heat in kWh may be gained from different biomass fuels. Information about the different fuel types available for biomass boilers, the regulations, considerations to take and information on procurement. Wood chips are small pieces of logs or wood waste. These are formed by passing through a chipping machine, which turns them into 30mm pieces, also known as G30. Wood pellets are a type of biomass fuel, made from compacted sawdust or other waste from saw-milling and manufacturing. At 4.8kWh per kg, you only need one third of the space that you'd need for wood chips. As a biomass fuel, logs will generally deliver 5.1kWh per kg, depending on moisture content and type of wood (hardwood or softwood, and species). Grain can be an economical and convenient fuel for use in biomass boilers. 'Pourable' grain such as oats, wheat and barley have a low nitrogen content. Being a slightly denser fuel than miscanthus, it will require less space to store for the same amount of heat. Miscanthus, (or 'elephant grass') is a perennial grass originating from Asia. It is becoming popular as an energy crop as it can easily and quickly grow on poor quality land with no need for fertilisers or very much intervention.